You can start bidding for a numbered Raspberry Pi beta board tonight! The two highest numbered boards go on auction on eBay at 10pm. More boards will be auctioned, with board number one the last to be offered. Details here. The Raspberry Pi team are taking a well-earned break over Christmas, but they've left a few more snippets to keep us happy. New photos, a facelift for the Forum, and an informative update to the About page. Let's hope the testing of the beta boards continues to go well. I'm still hoping for the limited edition auction before the end of the year, and a chance for everyone to buy one in in January! You can see one of the first Raspberry Pi beta boards booting on the RasbPi website. Amazing Video performance. It looks as if there's an easy-to-fix issue with the current layout. Liz has promised us more info tomorrow. The testing is going well, and with any luck we'll see the first few boards auctioned this year. Fantastic! Congratulations, Pi cooks. Have an excellent Christmas. The Raspberry Pi site has pictures of the first populated (beta) boards. If all goes well, ten of the boards will be auctioned this year, with production boards hitting their on-line store in January. I've just started using the Open Bench Logic Sniffer. 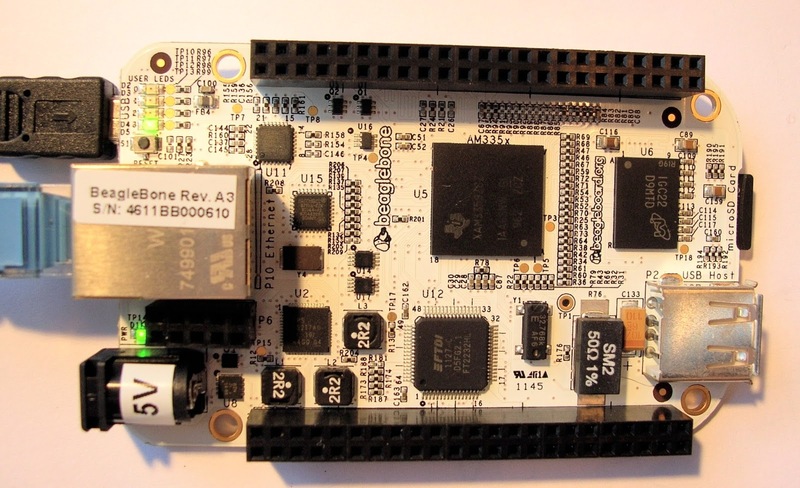 It's a very capable bit of open source hardware and it's supported by a highly functional Java client. Together they give you have access to the features of a commercial logic analyser at a fraction of the price. In the UK the board costs just under £50 including VAT. The software is free. There is one minor pitfall, though. The product's home page has a prominent link to the original SUMP client. That takes you to an old version which is no linger actively maintained - indeed I could not even fire it up. There is an actively maintained alternative which worked straight out of the box. There are also a number of firmware upgrades. I don't yet know if I need to apply any of these; I'll report when I do. The sniffer needs at least one accessory: a cable which connects the board headers to the circuit under test. A single cable gives you 8 connections; if you want to use 16 channels you will need two of them. You'll also need a USB cable with a micro connector, which is not provided. The sniffer and cables are available form seedstudios in Hong Kong. In the US you can buy from Sparkfun or the Gadget Factory. In the UK you can find them at SK Pang and ProtoPic. 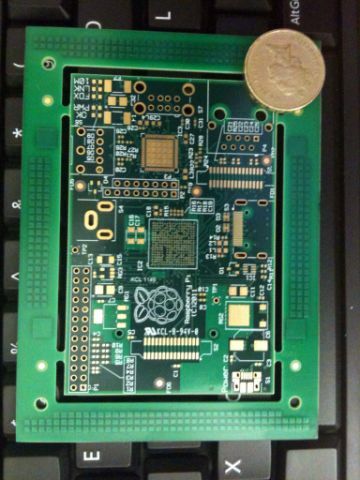 Raspberry Pi have posted some higher-resolution pictures of bare (unpopulated) boards from their first batch. The images are fascinating, not least because they show the scarily compact BGA connections which will link the main Broadcom processor to the board. There are hundreds of pads in a footprint the size of a postage stamp. The post makes clear that these are not the boards as customers will see them; the board you get will be sold fully populated, with components soldered on. These images are there to whet our appetite and keep us informed about the march towards shipment. Not only do we have a new version of the Arduino software, but the hardware has new retail packaging. Italian style at its best. Congratulations! And Kudos to the designers. 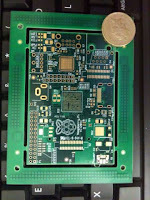 Raspberry Pi have just released pictures of the first batch of PCBs for Raspberry Pi. This amazing £25 system on a chip should be shipping in low volume before the end of the year. It's built up a huge following already, and the initial production run of 10,000 is likely to sell out fast. The pictures of the PBC layout were amazing, and the actual PCB is just as remarkable. The computer has the potential to change IT education, in this country and elsewhere, but much of its value lies in the way that it's motivated the community. The open source movement has shown that there is a huge pool of talented, motivated people who like to share their work. 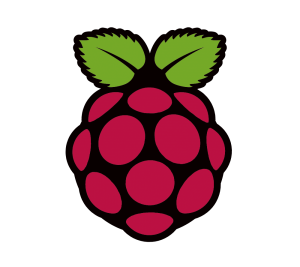 Raspberry Pi is a focus for those of us who would like to share with the next generation of technologists. It's a product for optimists. Arduino have released version 1.0 of the Arduino development environment. There's a lot of new functionality in the new release, and there are some significant changes. This blog post talks about an earlier release candidate, but presumably still applies. At the time of posting, the release notes stop at release 23, but that may be fixed by the time you read this. A quick test showed some of the new features, and some of the issues involved in migrating existing projects. The new IDE looks subtly different. Below you'll see a 'verify' button (shown as a tick) which you can use to compile a sketch without trying to upload it. I found that handy when checking the compatibility of existing code. 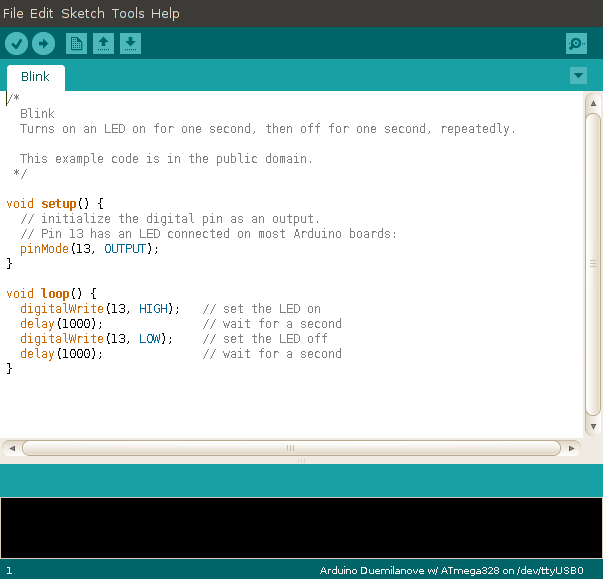 Finally, the extension for Arduino sketches has changed from pde to ino. The new IDE will recognise your old sketches, though, and when you save them a pop-up will remind you of the change before asking if you want to save the file with the new extension. That's handy, as it gives you an easy way to keep track of which sketches you've migrated. There are many other changes listed in the blog. I'll update this post if I come across anything crucial.